Alas Kedaton Monkey Forest’s name comes from alas, meaning ‘forest’, and kedaton, or ‘kingdom’. The area of Alas Kedaton is historically located between the Mengwi, Tabanan and Badung rajadoms. Thus theoretically, it should be considered as part of Mengwi, yet in reality the Tabanan royal family has developed most influence over this temple. 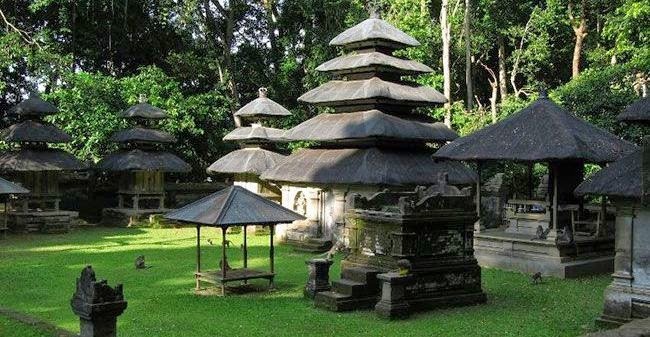 Inside the forest is a namesake temple, usually referred to as Pura Dalem Kahyangan Kedaton. This expansive complex is nestled amidst the dense woodland. Pathways surrounding the moss-covered temple walls provide a nice ambling tour, while the many places to stop and look over the shoulder-high partitions provide an insightful view into the temple grounds. The temple was built by the Hindu high priest, Mpu Kuturan, to unify the island’s Hindu sects, merging them into the Balinese Hinduism we know today. The high priest’s concepts allowed anyone from any caste or sect to offer their prayers at the Alas Kedaton temple. The Balinese long-tail macaques are considered sacred. So are the hoards of flying foxes that zoom through the misty forest lofts. Thus, the village locals, shopkeepers, guides and visitors are prohibited from harming them, no matter how impish and aggressive they may be. The wide open spaces, deep forest and attractive temple make Alas Kedaton a worthwhile visit, even without taking its wildlife into view. The Pura Dalem Kahyangan holds its piodalan temple anniversary every Anggara Kasih Tuesday on the Balinese Pawukon calendar or roughly 20 days after the Galungan celebrations. The heights of festivities take place during the day and conclude before sundown. The temple’s innermost grounds are the holiest and are discernibly lower compared to the outer perimeters. Four temple gates are located at the north, east, south, and west, with the west being the main gate. 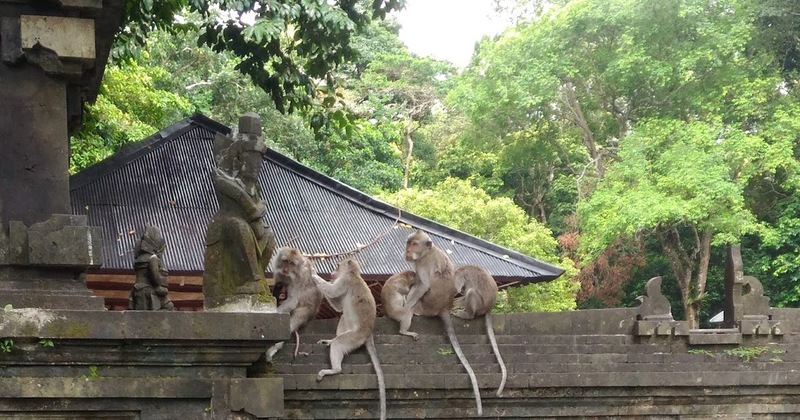 Good to Know about Alas Kedaton Monkey Forest The monkey forest is usually an included itinerary on tours to Bali’s west, such as temple visits to the Taman Ayun Temple in Mengwi to admire the imposing architecture of the past, as well as the majestic sea temple of Tanah Lot. Tall local nutmeg trees are home to this band of monkeys, and the shady ambiance provides a refreshing intermediate tour stop. It is not advisable to purchase the peanuts and bananas sold for feeding the animals. These monkeys are wild animals and dependence upon hand-outs disrupts their natural feeding cycle. Also a steady diet of peanuts and bananas tends to fatten them. Secondly, if you are doling out the food at a pace that doesn’t suit any one of those lined up to receive it, they will grab-quicker than lightning – and often bite to make you give up the tasty treats. The best rule of thumb – to prevent teeth in your thumb is to ‘look but don’t touch’. If you want to take a photo shoot with the monkeys, on your shoulders perhaps, better be very still and let the animals approach you in the first place, rather than chasing them about. And always remember to stay calm. Return through the souvenir shops, stop for a drink or select one of the eateries outside the gate for a snack or meal. Ensure that your menu has prices, before you order. Otherwise, it’s practice time to hone your bargaining skills!